I don’t know about you, but about this time of year I start to get a little stir-crazy. The holidays are over – the fun and energy and bright colors are gone – and it’s cold and snowy out there and no way will I be heading to my garden to play any time soon. Through pores on the surface of their leaves, houseplants absorb many of those nasty volatile organic compounds (VOCs) that pollute our indoor air, such as benzene, formaldehyde, trichloroethylene and xylene (found in some plastics, detergents, fabrics and building materials). Plants help to maintain indoor humidity levels, which can alleviate the problem of breathing dry air causing respiratory ailments such as asthma, bronchitis, and over all dehydration. 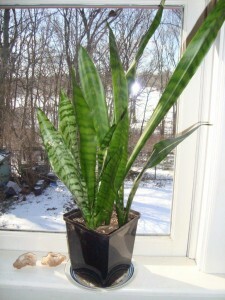 Negative ions, such as those produced by air purifiers, are created when plants breathe out. These negative ions attach themselves to dust particles, mold spores, bacteria and more and they fall to the floor, where they can be vacuumed up. And, of course, plants drink in carbon dioxide and pour out oxygen to refresh us from our winter doldrums. There are many easy-to-grow houseplants that will improve your indoor air quality, but some of the best according to a 1989 NASA Clean Air Study are Areca palm (Chrysalidocarpus lutescens), Lady Palm (Rhapis excelsa), Weeping Fig (Ficus benjamina), Peace Lily (Spathiphyllum), Golden Pothos (Epipremnum aureum), Dracaena reflexa, Snake Plant (Sansevieria trifasciata) and even the simple Spider Plant (Chlorophytum comosum). 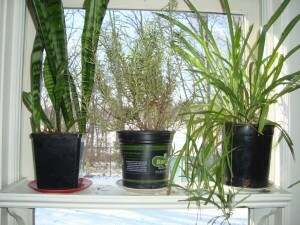 This entry was posted in Containers, Perennial plants, Plants and tagged Houseplants, Indoor air quality, Lyman Estate greenhouses, NASA Clean Air Study, Wellesley College greenhouses, Winter containers on January 14, 2016 by Christie Dustman. Ok, so I was pretty suspicious of the “let’s put down a blankie” idea for the garden before winter. If you have met me, you know that I am not the type of person who makes my own crackers. I buy them. In the garden, I will do fussy things but only if there is a good reason to do it. I resist babying plants and I resist doing things in the garden that make humans feel better rather than make an actual difference in the garden. As I read studies about using winter mulch, I realized that the reason for mulch is not the COLD per se – the problem is temperature fluctuation, often from the sun’s rays. Cold is cold. The goal of bed covering in winter is not to stop freezing – it is to minimize the top layer of soil from warming up and cooling down. This freeze-thaw action forces smaller plants up and dislodges them from the soil surface. Now vulnerable and stranded, the plant’s roots dry out. (Ok, so I feel a little sympathy now …) Warming soil during midwinter thaws can also encourage plants to come out of dormancy in addition to being popped out of the soil surface by plummeting temperatures. To assist your perennials (or more recently planted small shrubs) this winter, shade the soil around them to protect against the sun heating up the soil. Snow cover is the best winter insulator but is undependable – once we get snow, lightly push snow back onto beds when you can. 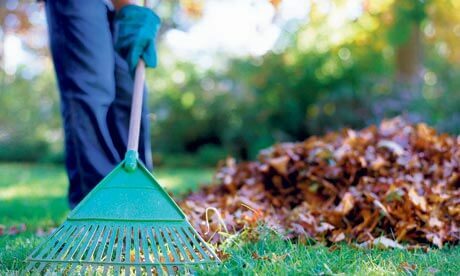 Before the snow comes, we recommend adding 2-4 inches of chopped leaves, pine needles, salt marsh hay or sterile straw over the crown of the perennials and around the root zone after you have cut the perennials back and after temperatures are staying consistently in the 50-40F range. More than just a comfort object, your garden’s ‘blankie’ of winter mulch will help keep it snug and minimize winter damage. 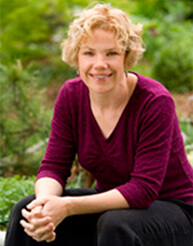 Let us help you put your garden beds to sleep before the snow flies! 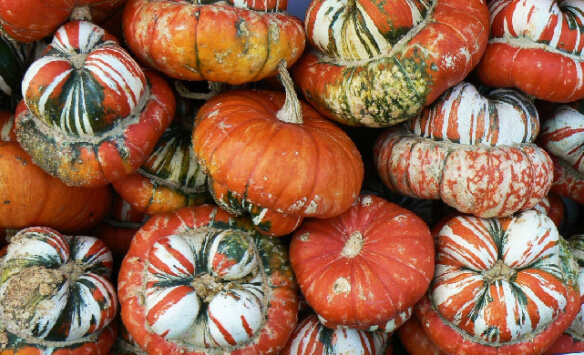 This entry was posted in Gardening, Landscape maintenance, Perennial plants and tagged Garden maintenance, Landscape maintenance, Leaf mold, Mulch, Perennials, Shrubs on October 20, 2015 by Christie Dustman. Every year around this time we send kids back to school, dodge increased traffic and get the feel of shorter days, cooler nights, and hints of the crisp scents of autumn. Our gardens and seasonal containers also start showing their age but that’s no reason to despair. Fall offers a whole other season to enjoy some of our favorite fall flowers and plants in our beds or spicing up containers. We can steer toward the traditional seasonal choices of golds, reds, yellows and oranges that are sure to warm us up, or cooler colors in blues, whites & purples too if that is our thing. Some favorite annuals include, as you’d expect, asters, mums, pansies & marigolds. But don’t stop with flowering plants. Adding ornamental grasses, peppers, kale, cabbage & millet adds texture and seasonal interest. Vegetables are not just for cooking anymore! We can also use perennials in containers that do double duty – just pop them into the ground before the first major frost and enjoy them next spring and summer. Heuchera, Euphorbia x martini, Sedums, Lavender and Sage are some great choices. We like the multitude of unusual gourds, colorful pumpkins and Indian corn that becomes available as well! 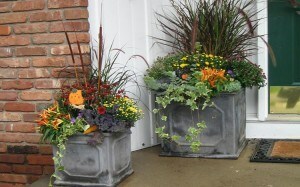 This entry was posted in Containers, Design, Four-season interest, Perennial plants and tagged Autumn, Autumn containers, Container gardening, Ornamental grasses, Perennials on August 26, 2015 by Christie Dustman. What color is your grass? Many idolize the rich emerald green of a lawn. I must confess that after I’ve planted a small patch of lawn in my reconfigured backyard, I have green lawn envy too. 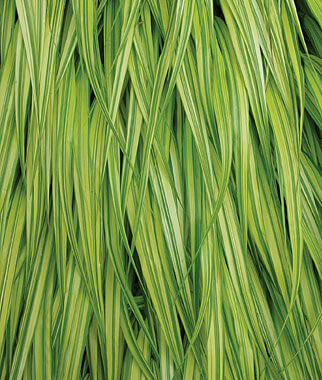 But what about ornamental grasses that come in a wide range of colors, shapes, textures and sizes? The category of “ornamental grasses” encompass a larger range of species, including Bamboo, which is technically a grass, and Carex, which is a sedge and not a true grass. 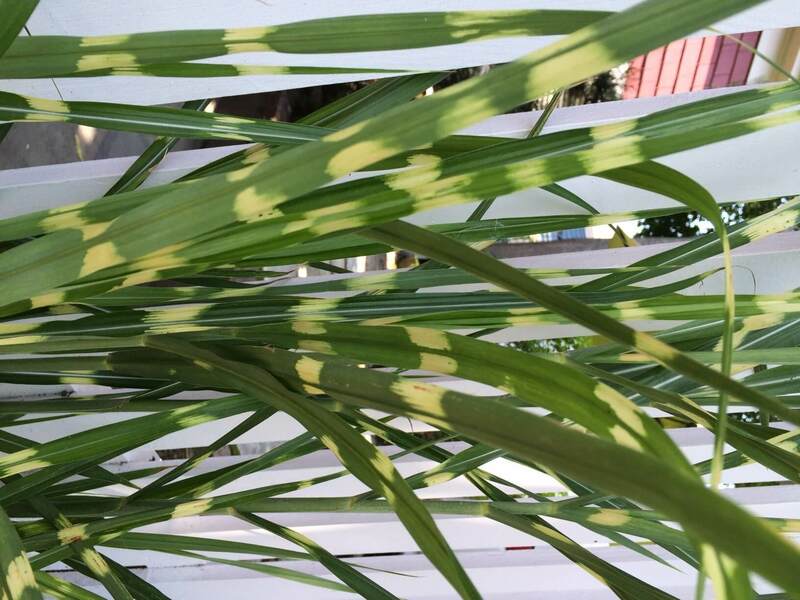 We tend to lump all plants that appear to grow like our beloved Lawn grass, regardless of its actual genus, into the ornamental grass family. Grasses provide a foil for the flowering lovelies of the season but also give seasonal variation including texture, showy flowers, fall color and winter structure and interest. 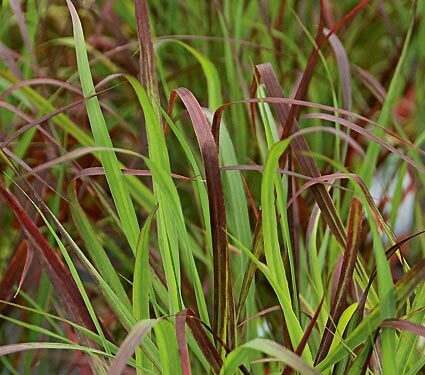 When it comes to ornamental grasses and color, do you have a color preference? There are the cool blues which can vary from silver-blue to blue-green. Think about those cute little tufted mounds of blue fescue or blue oat grass – I’ll admit it, I’ve seen it used well and not so well. Also yellow, green and variegated are worth considering too. 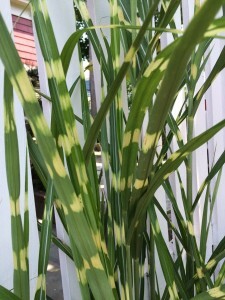 Two of my favorites, which both thrive in partial sun to shady conditions are Hakonechloa macra (Japanese forest grass) available in green and yellow with bright green variegation, mounds beautifully on a slope or the edge of a path; and Carex morrowii ‘Ice Dance’ which has green leaves edged in creamy white. This Carex stands up to winter – just give it a serious haircut in spring before the new growth to keep it looking great for the rest of the year. For sunny locations consider Miscanthus sinensis ‘Strictus’ also known as Porcupine grass because of its yellow horizontal banding and stiff upright appearance. It’s a real conversation piece. 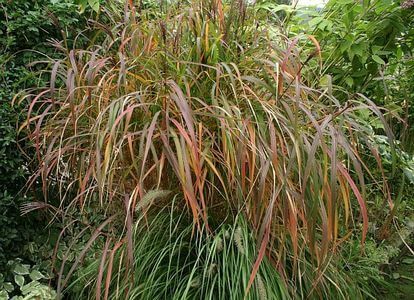 To introduce red, there is Miscanthus ‘Purpurescens’ with its green foliage developing a red color in autumn as well as Panicum virgatum ‘Ruby Ribbons’ with hues of deep red and red seed heads in mid-to-late summer. Purple can be found in the tinged blades of Panicum virgatum ‘Shenandoah’ that deepen in color during the season. So you see, the grass isn’t always greener, sometimes it’s the color of the rainbow. Let us help you find your color. This entry was posted in Four-season interest, Garden Design, Perennial plants, Plants and tagged Bamboo, Blue oat grass, Carex, Fescue, Grasses, Hakonechloa macra, Miscanthus, Ornamental grasses, Panicum virgatum on July 9, 2015 by Christie Dustman.